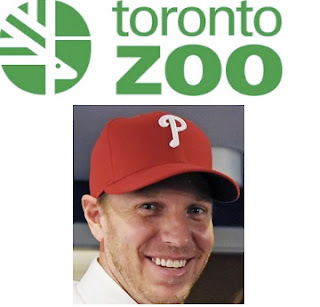 The following is what will ideally be the introduction to a fruitful discussion concerning Roy Halladay's zoological preferences and affinities- an email that I sent to our friends at the Toronto Zoo. Let's hope they can help us out. Once I hear back I'll post for all. Hello. I'm writing today with a quick inquiry, though- in the interest of full disclosure- as the editor of a wildly successful (169 unique visitors) blog revolving around my interest in going to the zoo with Roy Halladay (http://zoowithroy.blogspot.com). As everyone knows, Doc spent more than a decade in, and was revered by, the city of Toronto. My question to you, and I'd be thrilled with any help you could offer, mind you, is as such: Did Roy go to the zoo? Frequently? P.S. You're Tundra Trek exhibit looks really cool. If I'm up there any time soon I'll surely check it out.